The wintery weather is finally starting to melt away and sunbeams are gradually getting warmer – spring is on the way! Budding blossoms have begun to burgeon, adding subtle pops of colour in household gardens, along roadsides and in botanical grounds, looking positively delightful and good enough to eat. This spring, why not spruce up your seasonal dishes with dashes of flavourful flower fronds? 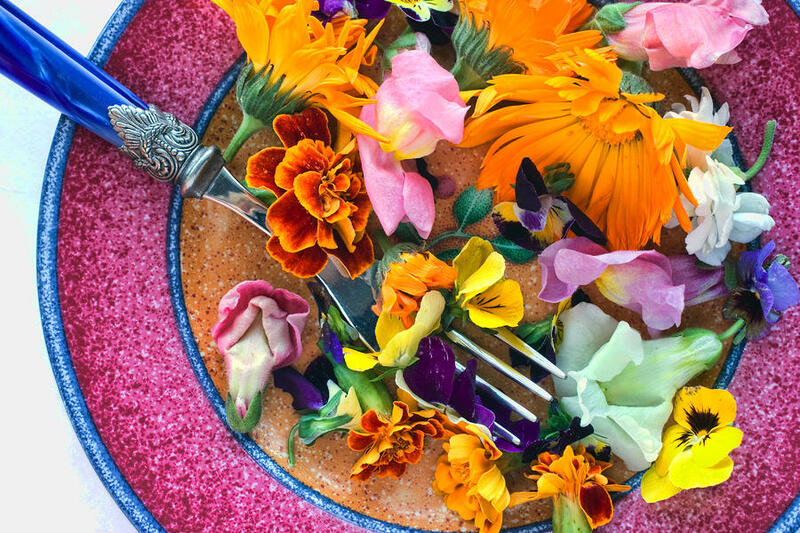 The incorporation of flowers in food is an old practise that dates back to antiquity – the Greek, Roman and Mesopotamian cultures were fond of adding buds and petals to their dishes and since then, the creation of floral foods have become quite crafty. Not all flowers are edible and some species can be quite harmful, so it’s imperative that you consume flowers safely. Unless you’re eating at a restaurant, like Katjiepiering, a good rule of thumb would be to grow the goods yourself, that way you can trust that your blossoms aren’t tainted with pesticides or car exhaust fumes. Flowers purchased from a florist or from a seller stationed on the roadside are not advisable for consumption. 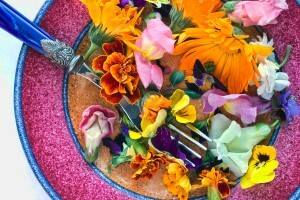 That being said, adding flowers to dishes adds a touch of flavour, colour and whimsy and can be used to achieve a range of different flavours from sweet to spicy. ~ All flowers from the alium family are edible and you’re probably quite familiar with these aromatic blossoms – garlic, chives and leeks all form part of the alium flower group. ~ Basil blossoms have a similar, but milder, flavour to the leaves and come in an assortment of colours from white to soft lavender. ~ Marigold is a great flower for food; not only does it add a splash of gold to your plate, the petals are peppery and tangy in flavour and a good complement to spicy dishes. ~ The sweet petals of the carnation need to be trimmed at the base before eating. ~ The cilantro blossom has the same grassy flavour as the leaves and ought to be used fresh. ~ The flowers from citrus trees (think lemon, lime, orange and grapefruit) are deliciously sweet and very fragrant. These waxy blossoms should be used sparingly to avoid over-whelming the dish with its strong perfume. ~ Clover flowers are sweet in taste and nuanced with notes of liquorice. ~ Fennel flowers have a lovely yellow colour and a liquorice flavour. ~ For a tart cranberry flavour, hibiscus blossoms are what you’ll need. Great for tea or desserts. ~ Jasmine, another popular flower for flavoured tea, is a springtime flower with a characteristic perfume. Use frugally in sweet dishes. ~ For sweet or savoury dishes, use lavender – these fragrant, spicy flowers add a delightful touch to dishes. ~ Just like the leaves, mint flowers are (surprise!) minty in flavour and can vary in intensity depending on the bud you picked. ~ All roses are edible and their petals have a delicate flavour, ideal for desserts and jams. Cut away the bitter base (the white part) of the rose before eating. ~ The pine-like, sweet and savoury flavour of the rosemary blossom tastes like a milder version of the herb. ~ Squash and pumpkin blossoms, typically called Zucchini blossoms, have a mild but sweet flavour. These flowers are wonderful for stuffing. ~ The petals of a sunflower are slightly bitter but are great for savoury dishes. Additionally, the unopened bud can be steamed like an artichoke. ~ Violets have a sweet, nectar flavour and can be used in salads, desserts, or as bright purple garnishes. If you would prefer to rather smell than eat these flowers, the Stellenbosch Botanical Garden has a wide variety of rare and curious flora and Villa Grande’s restaurant is situated in its centre, which makes for beautifully fragrant mealtimes without biting down on any buds.